Around 20,000 homeless people took to the streets of São Paulo on Tuesday demanding that public officials resolve the city’s devastating social housing crisis, which critics argue is partially due to real estate speculation by large property developers. 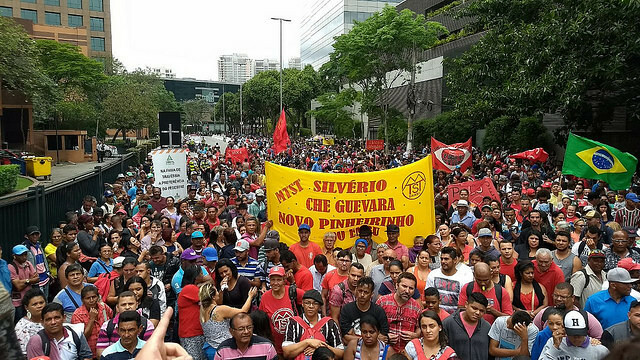 After a 14-mile long march, which began in the outskirts of São Paulo and concluded at the entrance of the São Paulo state government headquarters, representatives from Brazil's Homeless Workers Movement (MTST) held negotiations with the city’s top housing and planning officials. After the three hours of discussions, MTST coordinator Guilherme Boulos issued a statement saying that the discussions lead to important advancements in their demands for dignified housing. With more than 12 million people, Brazil's largest city is in the midst of a serious housing crisis, with a population of 1.2 million homeless or precariously housed citizens. As a result of Tuesday's negotiations, officials with the Housing and Urban Development Company (CDHU), the agency responsible for housing regularization, agreed to begin registering more than 7,000 people currently living in the land occupation site in Sao Bernardo do Campo city. The Sao Bernardo do Campo occupation site, which was occupied last September, is mainly comprised of unemployed and homeless people demanding decent housing. The land occupation is located on a 60,000 square meter vacant lot, which is owned by the MZM construction company. "Today marks a huge organizational victory and represents the willingness to fight for the homeless people of this city. In scale, this is the largest march that the MTST has ever held. Occupy São Bernardo has become a symbol of the serious problem of homelessness in this country,” said Michel Navarro, a state coordinator with the movement told Brasil de Fato. The MTST is Brazil's most influential housing rights organizations, with around 50,000 members coordinating more than 30 occupations across São Paulo. The march, which began early Tuesday morning, included the participation of elderly women, children, teachers and many other members of civil society, in attempt to bring visibility to the housing crisis across the country. An estimated 48 million of Brazil’s population, or close to 25% lack housing altogether, or live in inadequate housing. "We are struggling for the São Bernardo occupation site and for many of other MTST urban occupation sites. The housing deficit in the capital city of São Paulo is enormous, which is largely due to city’s lack of investment in housing,” Bruno Magalhães, a teacher who participated in yesterday's march told Brasil de Fato. In order to address the pending requests issued by the MTST, government officials have agreed to hold a follow up meeting on November 10th, where the two parties will continue to discuss the issue of the right to dignified housing. The MTST’s primary mode of political protest and negotiation is through "occupations" wherein they squat on underutilized lands that are being held vacant for speculation. Vacant or unutilized is not permitted according to the 1988 Brazilian Constitution, which stipulates that that all land must serve a social purpose.